A broken bust of Bharatiya Jana Sangh founder Syama Prasad Mukherjee was found in a pile of garbage in a godown here on Saturday. It is yet to be ascertained that who vandalised Mukherjee's statue or how did it ended up in the garbage. An investigation for the same is underway. In similar incidents, last month, Mukherjee's idols were vandalised in Kolkata's Jadhavpur University and Kokrajhar in Assam. 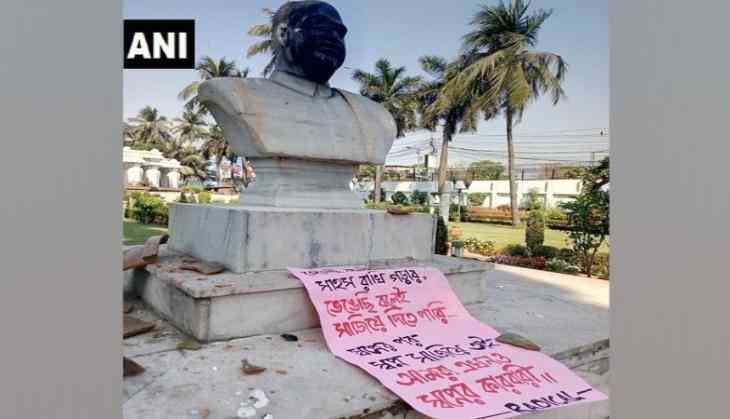 It all started when a statue of Russian communist icon Vladimir Lenin was razed after the Bharatiya Janata Party (BJP) swept the Left Front government out of power in the assembly elections in Tripura last month. Soon after, the statue of social reformer and rationalist leader E.V. Ramasamy, popularly known as Periyar, was vandalised in Vellore in Tamil Nadu. Earlier this month, statues of the Father of Indian Constitution B.R. Ambedkar was found defaced in Madhya Pradesh, Rajasthan and Uttar Pradesh respectively. Earlier this week, the bust of Mahatma Gandhi's statue was found decapitated in Nathdwara in Rajasthan. Last month, a statue of the country's first Prime Minister, Jawaharlal Nehru, was defaced with ink in West Bengal.